The Martian marches into the coveted “#1 movie in the world” spot for good reason. 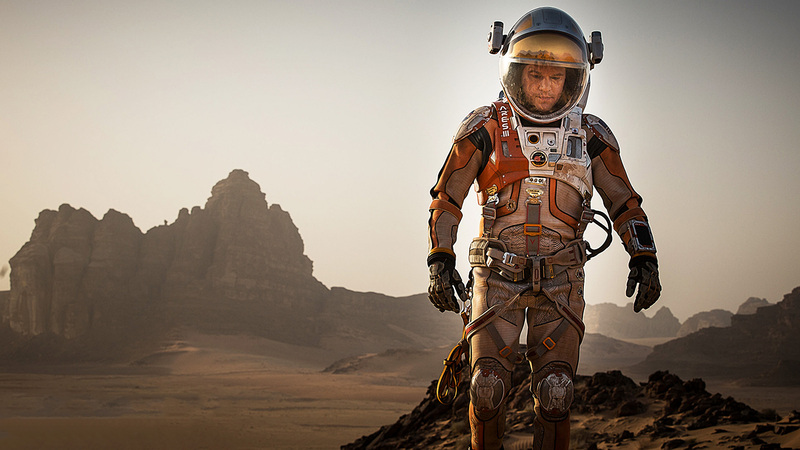 Ridley Scott hit another home run with a film that yet again seeks to bring Matt Damon home. We never grow tired of chasing that man. Private Ryan, the Bourne trilogy, Interstellar, now The Martian. This film is a giant leap for outer space storytelling after many films that take only small laborious steps from one malfunction to the next. This film achieves the same survival efforts but perks up the pace by blending them with upbeat attitudes and humor, a boost for math and science education, and a swell of hope. We wonder if we’d make it. On the reality tv series Survivor, it’s more about interconnectivity and socio-relational survival. You’ve gotta win the trust of the right people. Our Martian is all alone but can somehow function, create, self-motivate, and build. Fortunately he is vlogging, or video journaling, instead of talking to a volleyball. There is a countdown, rationing, always a next step. Then the supporting cast gets to work. The future NASA as it is presented, looks feasible as they pull an Apollo 13 by pooling their efforts and collective genius. Jeff Daniels, Kristen Wiig, Donald Glover, Jessica Chastain…the list goes on. It’s a beautiful cast on a film worth seeing. Damon’s character Watney sees problems as opportunities. He strategizes and builds, sets deadlines and works hard to meet them. In his own quirky way, he says goodbye to every little thing, thanking storage bins and chairs for helping him make it each day. Gratefulness goes a long way. And whether he survives or not, you feel, as he does, simply thankful for each day, each sunrise, each plant, each breath. The message of this film is clear: life is precious and worth fighting, striving, creating, growing, learning, laughing, surviving for. Don’t miss it, any of it. If you have already seen The Martian, check out this great article about the science of the film!